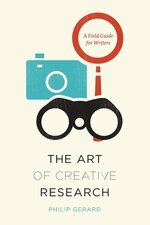 From the author of Stylish Academic Writing comes an essential new guide for writers aspiring to become more productive and take greater pleasure in their craft. Helen Sword interviewed one hundred academics worldwide about their writing background and practices. Relatively few were trained as writers, she found, and yet all have developed strategies to thrive in their publish-or-perish environment. So how do these successful academics write, and where do they find the "air and light and time and space," in the words of poet Charles Bukowski, to get their writing done? What are their formative experiences, their daily routines, their habits of mind? How do they summon up the courage to take intellectual risks and the resilience to deal with rejection? Sword identifies four cornerstones that anchor any successful writing practice: Behavioral habits of discipline and persistence; Artisanal habits of craftsmanship and care; Social habits of collegiality and collaboration; and Emotional habits of positivity and pleasure. Building on this "BASE," she illuminates the emotional complexity of the writing process and exposes the lack of writing support typically available to early-career academics. She also lays to rest the myth that academics must produce safe, conventional prose or risk professional failure. The successful writers profiled here tell stories of intellectual passions indulged, disciplinary conventions subverted, and risk-taking rewarded. Grounded in empirical research and focused on sustainable change, Air & Light & Time & Space offers a customizable blueprint for refreshing personal habits and creating a collegial environment where all writers can flourish. All writers conduct research. For some this means poring over records and combing, archives but for many creative writers research happens in the everyday world-when they scribble an observation on the subway, when they travel to get the feel for a city, or when they strike up a conversation with an interesting stranger. Few people can write on the English language with the authority of Bryan A. Garner. The author of The Chicago Manual of Style's popular "Grammar and Usage" chapter, Garner explains the vagaries of English with absolute precision and utmost clarity. With The Chicago Guide to Grammar, Usage, and Punctuation, he has written the definitive guide for writers who want their prose to be both memorable and correct. Throughout the book Garner describes standard literary English--the forms that mark writers and speakers as educated users of the language. He also offers historical context for understanding the development of these forms. The section on grammar explains how the canonical parts of speech came to be identified, while the section on syntax covers the nuances of sentence patterns as well as both traditional sentence diagramming and transformational grammar. The usage section provides an unprecedented trove of empirical evidence in the form of Google Ngrams, diagrams that illustrate the changing prevalence of specific terms over decades and even centuries of English literature. Garner also treats punctuation and word formation, and concludes the book with an exhaustive glossary of grammatical terms and a bibliography of suggested further reading and references. 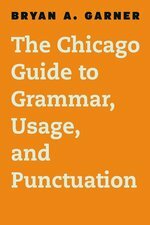 The Chicago Guide to Grammar, Usage, and Punctuation is a magisterial work, the culmination of Garner's lifelong study of the English language. The result is a landmark resource that will offer clear guidelines to students, writers, and editors alike. With more than three-quarters of a million copies sold since its first publication, The Craft of Research has helped generations of researchers at every level--from first-year undergraduates to advanced graduate students to research reporters in business and government--learn how to conduct effective and meaningful research. Conceived by seasoned researchers and educators Wayne C. Booth, Gregory G. Colomb, and Joseph M. Williams, this fundamental work explains how to find and evaluate sources, anticipate and respond to reader reservations, and integrate these pieces into an argument that stands up to reader critique. Following the same guiding principle as earlier editions--that the skills of doing and reporting research are not just for elite students but for everyone--this new edition retains the accessible voice and direct approach that have made The Craft of Research a leader in the field of research reference. With updated examples and information on evaluation and using contemporary sources, this beloved classic is ready for the next generation of researchers. Are you trying to publish an article or monograph, revise a dissertation, create a new textbook, compile an anthology, or write a trade book? Should you sign the publishing contract you have been offered? Is it wise to publish in an electronic journal? How much can you expect to earn from your writing? What are your legal and ethical responsibilities as an author? What can you expect from your publisher? 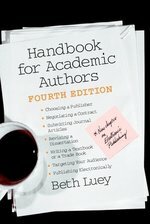 In the fourth edition of this widely recommended book, Beth Luey offers answers to these questions, as well as practical advice on negotiating a contract, preparing an electronic manuscript, seeking permission to reproduce text or artwork, choosing illustrations, and indexing. She also suggests ways to write clearly not only for one's peers but also for students and general readers. A chapter on the business side of publishing explains costs and pricing for print and electronic products. This edition brings advice to academic authors fully into the age of the Internet and the World Wide Web; both the text and the bibliography have been completely updated and a new chapter evaluates various electronic media for different kinds of publications and suggests ways for the technologically ambitious author to use them to best advantage. Beth Luey teaches and does research on the history of the book, scholarly publishing and current issues in authorship and reading at Arizona State University. She is the author (with Martha Broderson) of A Guide to Book Publisher Archives (Book Industry Study Group, 1996) and The Structure of International Publishing (Transaction Publishers, 1992). This updated reference guide directs students to over five hundred significant theological resources across a wide area of theological research. It details bibliographic sources for encyclopedias, dictionaries, and electronic resources in biblical studies, historical studies, theology, and practical theology. When Kate L. Turabian first put her famous guidelines to paper, she could hardly have imagined the world in which today's students would be conducting research. Yet while the ways in which we research and compose papers may have changed, the fundamentals remain the same: writers need to have a strong research question, construct an evidence-based argument, cite their sources, and structure their work in a logical way. A Manual for Writers of Research Papers, Theses, and Dissertations--also known as "Turabian"--remains one of the most popular books for writers because of its timeless focus on achieving these goals. This new edition filters decades of expertise into modern standards. While previous editions incorporated digital forms of research and writing, this edition goes even further to build information literacy, recognizing that most students will be doing their work largely or entirely online and on screens. Chapters include updated advice on finding, evaluating, and citing a wide range of digital sources and also recognize the evolving use of software for citation management, graphics, and paper format and submission. The ninth edition is fully aligned with the recently released Chicago Manual of Style, 17th edition, as well as with the latest edition of The Craft of Research. Teachers and users of the previous editions will recognize the familiar three-part structure. Part 1 covers every step of the research and writing process, including drafting and revising. Part 2 offers a comprehensive guide to Chicago's two methods of source citation: notes-bibliography and author-date. Part 3 gets into matters of editorial style and the correct way to present quotations and visual material. A Manual for Writers also covers an issue familiar to writers of all levels: how to conquer the fear of tackling a major writing project. Through eight decades and millions of copies, A Manual for Writers has helped generations shape their ideas into compelling research papers. This new edition will continue to be the gold standard for college and graduate students in virtually all academic disciplines. The classic work on parliamentary procedure that has been in print since 1876 (4,350,000 copies sold) is now available in a masterful revised edition. The long-awaited second edition of the essential style manual for writing and publishing in biblical studies and related fields includes key style changes, updated and expanded abbreviation and spelling-sample lists, a list of archaeological site names, material on quranic sources, detailed information on citing electronic sources, and expanded guidelines for the transliteration and transcription of seventeen ancient languages.